This was a joint meeting with the Geology Section. Twenty-seven members gathered in the amphitheatre at Brading Roman Villa for a demonstration by John Winch in the art of flint knapping. John had gathered some flint nodules from Whitecliff Bay, which he laid out on a sheet together with 2 red deer antlers, 5 antler hammers, sonic tines from an antler, and some hammer stones. Firstly, he explained that although he used a saw to cut the hammers and tines, our ancestors would probably have used an ember from the fire and scorched round until the piece broke off. The flint nodules have to be selected with care as some could be damaged by frost, which causes scarring and flaws. By tapping the nodule the sound created gives an indication if a flaw exists. John then handed round pairs of tools. One of each pair he had made earlier and the other had been made in pre-history. For example: a Palaeolithic hand axe, a Mesolithic hand axe, a barbed and tanged arrowhead, a leaf point arrowhead, a transverse arrowhead, a scraper and a knife. Sitting on an upturned bucket complete with cushion, John next covered his left leg with leather, placed a leather shield on his left hand, and demonstrated how to go about making flint tools. He tapped several nodules before finding one of good quality and then used a hammer stone to strike off flakes, with the aim of making a hand axe. He continued to work his way round and round the flint to get the required shape but came across a fault, and although he continued it eventually caused the failure of the axe. Some of the waste flakes were of the required shape to make scrapers or arrowheads. Finally, John produced a red deer skin and used one of the scrapers he had just made to remove the fat deposits and thereby to make the hide supple, he also used one of the flints to cut a piece off very efficiently. After a scraper has been used a gloss can be seen on the scraper. All in all, a very enjoyable afternoon. Around sixty members gathered at the newly-reopened Brading Roman Villa for a review of developments over the last twelve months. Lead project archaeologist Kevin Trott introduced curator Neville Carr, who thanked the volunteers from the Society for the work they had put in at the villa, which had contributed in no small measure to the project’s success. Kevin began by referring to the research he had carried out on the Victorian excavators John and Hilton Price, working in the 1880s; the original discovery of the villa by Mr William Munns of Morton Farm; Captain John Thorp, who had ten or eleven local farm labourers working for him; and Mr 0glander, who took over around 1900. There has consequently been confusion over who discovered what; and finds at one stage were all piled together in one big heap, with some artefacts having disappeared or been sold off, others stuck together with glue, and so on. Part of Kevin’s job has been to try pulling all this diverse material together and to carry out a reassessment on it, with various artefacts dispersed anew to various experts round the country, accompanied by a process of state-of-the-art conservation where appropriate. The aim was to have the full assemblage back in place during the new year. The earliest finds on the site date to the Mesolithic period, around 8000 years ago. There have been Bronze Age artefacts – including a chisel, socketed axe. and pottery – as well as Iron Age finds. The Vectis Searchers metal detectorists have also done a sterling job on the coins. The main building of the villa itself had been completed by 270/ 280 AD, consisting of a corridor, two wings, and two sets of rooms behind; this may have cut away the majority of a 1st century building. Various mosaics were inserted up to c.320 AD. Then in 350/ 60 a catastrophic fire destroyed most of the villa, with remains of burnt plaster and molten window glass left to tell the tale. Another phase of building followed this, and then between 420 and 450 at least three individuals were buried on site; people were also living in the vicinity, butchering sheep and cows. Finally, around 460/ 70 a pit was dug and items were ritually buried there, effectively putting the site to sleep. There is no further evidence until the Mediaeval period, when tiles indicate a mediaeval building in the area. Surprisingly, someone was even living on the site in the Victorian period – a curator, perhaps? Embarking on a tour of the villa itself’, members could not help be impressed by the transformation of the site by the new buildin(l, and how astonishingly bigger it now appears in its new surroundings. Kevin pointed out that 45 carpenters had worked on site for four months and eight-and-a-half cement lorries of concrete were used in its construction. It is the most modern building preserving an archaeological site to date, a perfect blend of architecture and archaeology whilst also designed to blend in with the landscape. The drum tower architecturally reflects the original entrance, and at the same time takes the load for the whole structure. If any building ever deserved an architectural award, this one does! With the villa’s vastly improved interpretation boards, one’s attention was directed to many new facets, such as the ‘very special room’ where a lot of healing went on, especially of the eyes; the Iron Age farmstead which stood two miles to the west, at Knighton; the skeleton of a man buried without ceremony a mile from the villa; the nymphaeum, now displayed to full advantage inside the main building; the staggering number of coins retrieved from the well right up to modern times, and now on full display; and the corn-drying oven, now much more visible by the front door. We finally regrouped in the seminar room for tea and cakes kindly provided by the villa, and watched a video showing the construction of the new building by Stoneham Construction, to the design of local architects Rainey Petrie. A key feature was the sedum grass roof – laid as one would a turf lawn – blending into the landscape, and changing colour in the course of the year. What never fails to strike one about Brading Roman Villa is its multilayered richness: with its many finds and varied perspectives, there is always something new to discover, some new approach to consider, however many times one comes back to it. And all this has been multiplied in the course of the last year. That was the key message everyone took away from this enthralling session. It is a truly remarkable place, now displayed to its full glory. ‘The Seabed In Prehistory – 6th November. a talk by Paul Baggaley. There was a large gathering at Arreton for a talk by Paul Baggaley, a geophysicist with Wessex Archaeology, on ‘The Seabed In Prehistory’. 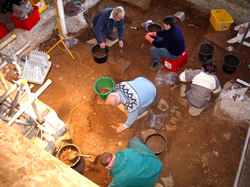 Wessex Archaeology have been running coastal and marine projects since 1994, and employ professional divers as well as archaeologists. There is now a growing legal basis for marine archaeology, which began with the Protection of Wrecks Act 1973. The main focus of the talk was the Seabed Prehistory Project, which is funded by the Aggregate Levy Sustainability Fund – Paul pointed out that if it were not for the aggregates firms, research wouldn’t be done at all; whilst at the same time much of the seabed does need protecting. The project comprises a study of the Palaeo-Arun River in the English Channel: its aim is to better understand the extent and character of seabed deposits, to develop new methodologies, and to guide industry and regulators over the question of marine aggregates. Before dredging can take place, an archaeological assessment must now be made alongside several other assessments including marine ecology. There are 55 Lower Palaeolithic sites dating back to 18,000 BP, 140 Palaeolithic and 81 Mesolithic sites. Hunter-gatherers would have used the river valley that is now the English Channel. Basic equipment for seismic surveys – prospecting for sites – comprise the intriguingly-named Boomer, Pinger and Chirp survey equipment: 257 kilometres of survey lines have so far been done on the project, with the palaeo-channel having turned out to be in the higher area of the seabed, instead of the lower area which had been expected. Alongside the seismic surveys there is seabed sampling – a form of geotechnical investigation. The vibrocoring programme consists of 20 cores, at 10 different locations. These have produced evidence of a peat layer, overturning archaeologists’ previous claims that such evidence had eroded away. This layer gives evidence of a 9,300-year-old land surface: this was backed up by pollen analysis of fine sediments, indicating virgin pine woodland before reed swamp took over and the area became submerged for 8.000 years. Geotechnical investigation also includes grab sampling, where gravels are washed and sorted and evidence of worked flints is sought. The overall conclusions so far provide evidence of stable landscapes surviving offshore, with artefacts of human origin, and much potential for Palaeolithic and Mesolithic deposits. Paul also outlined the Wrecks on the Seabed Project currently underway at Wessex Archaeology. The main aim here is to develop a methodology for assessing wreck sites using geophysical and diving techniques. Britain has been an island for 10,000 years now, and there are a great many such sites, with 40,000 wrecks in the National Monuments Record and 26,000 more in the UKHO Wreck Index. Some of these are protected shipwrecks. Techniques for surveying these include: Sidescan Sonar, which produces illustrated examples of patterned images: Magnetometer data for metal wrecks: and diver surveys. By contrast, Multibeam Sonar allows the shipwreck to be viewed in a 3D way, without the wreck being disturbed or damaged in any way. Paul showed several interesting examples of these, including anchors and cannons – a less obvious kind of wreck site but equally important. Twenty-five members and guests gathered for the Section’s first meeting in the Conference Room at the Coastal Visitors Centre, Ventnor, by kind permission of Robin McInnes, for an illustrated talk by Alan Phillips on ‘The Norse Background to Anglo-Saxon Pagan Religion’. The main focus was on the Norse/ Germanic religious and mythological belief-system which underpins Anglo-Saxon paganism – however the latter may have arrived on these shores, whether by conquest or assimilation. A more detailed survey of the Anglo-Saxon pagan finds might well be the subject of a further session. Tacitus’ account of German paganism in the very early period was outlined, with a strong emphasis on horse magic and sacrifice. Several well-preserved Danish human bog bodies have survived from this period, ritually sacrificed as a fertility offering to the Earth Mother. The chief deities in the two rival Norse pantheons were then described. Foremost was the great god of war and battle Odin, more feared than loved, and often reproached for his treachery to the losing side: but as Lord of the Gallows he suspended himself in agony from the great tree of knowledge to obtain the secret of the runes. His warriors were the Berserks or ‘bear-shirts’, who went into battle in an utter frenzy. Thor by contrast was much loved as the god of the sky and all-weathers, protecting humankind with his great hammer. Frey was a male fertility deity carried round in a wagon, a god of peace and plenty whose followers, remarkably, avoided war in a society besotted with the war ethic. His sister Freyja, the witch-goddess. was mistress of Seidr or the magic arts, whose seeresses practised a form of trance divination to retrieve the souls of the sick from the underworld. Balder was the youthful deity of tremendous beauty whose tragic death was brought about by Loki the sinister mischief-maker, who in turn is punished for his deed but ultimately strikes back by helping bring about the doom of the gods. Despite this cataclysm, a new order will be reinstated with the sons of Odin, and Balder will return to restore a new greenness to the earth. This picture may have been influenced to some extent by the incoming Christian religion, and the talk ended with a consideration of the likely impact of the new religion on the old one, and the greater certainty and authority that the new religion brought with it. After some interesting questions and discussion, the company adjourned to the upstairs studio to partake of some seasonal fare.